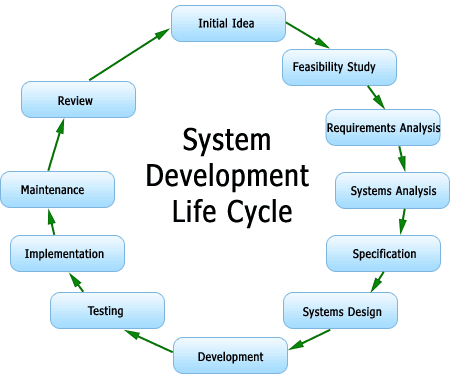 The systems development life cycle (SDLC) is a conceptual model used in project management that describes the stages involved in an information system development project, from an initial feasibility study through maintenance of the completed application. Various SDLC methodologies have been developed to guide the processes involved, including the waterfall model (which was the original SDLC method); rapid application development (RAD); joint application development (JAD); the fountain model; the spiral model; build and fix; and synchronize-and-stabilize. Often, several models are combined into some sort of hybrid methodology. Documentation is crucial regardless of the type of model chosen or devised for any application, and is usually done in parallel with the development process. Some methods work better for specific types of projects, but in the final analysis, the most important factor for the success of a project may be how closely the particular plan was followed. If there is an existing system, its deficiencies are identified. This is accomplished by interviewing users and consulting with support personnel. The new system requirements are defined including addressing any deficiencies in the existing system with specific proposals for improvement. The proposed system is designed. Plans are created detailing the hardware, operating systems, programming, and security issues. The new system is developed. The new components and programs must be obtained and installed. Users of the system must be trained in its use, and all aspects of performance must be tested. If necessary, adjustments must be made at this stage. The system is put into use. This can be done in various ways. The new system can phased in, according to application or location, and the old system gradually replaced. In some cases, it may be more cost-effective to shut down the old system and implement the new system all at once. Once the new system is up and running for a while, it should be exhaustively evaluated. Maintenance must be kept up rigorously at all times. Users of the system should be kept up-to-date concerning the latest modifications and procedures.